That's right, I'm joining the wowser brigade. Recently, a lot of blog posts have been about anger (have you noticed?). The reason for this is because I've been noticing it a lot. I think what you focus on you see more of - I've been focusing on anger. Last night I fell in a ditch. Not literally, but emotionally. Everywhere I turned there was anger. Everyone was being sarcastic and negative and seeing fault in everything and the world felt like a bad, bad place. My Facebook stream was full of torture animals (this seems to be the new 'do you think this injured child is beautiful' movement. Many of my friends are into posting photos of tortured animals to bring awareness of animal torture to the world - it's all good and well, I'm all for information dissemination but it is starting to feel like the world is an evil, horrible place, a place I wish I hadn't birthed my children into). So, I talked to the Grumpy Old Man. I said I felt we needed to make sure our home was a good place, a safe place, a haven from all the violence and horror out there. Where men and women seem to hate and mistrust each other, where animals are tortured, where children are abandoned and people are abducted from the streets or killed on them, even by the police. I saw that in the northern territory, residents can opt for their homes to be 'alcohol free houses', where if someone brings alcohol to the house, the home owner can call the police and have them forcibly remove for breaking the law. I thought maybe I could make this house, our house, a violence free home where people speak to each other with respect and only touch each other with respect (and by that I mean not grabbing, no pushing, not hitting) and purposely look for the good in one another, instead of what annoys them and irritates them. I said that I would like this place to be a swearing free zone, too. I kind of said that bit without even thinking about it - and then went back and had a think about it... This is what I came up with. When I met the Grumpy Old Man, I did swear, not a lot, but occasionally - I'd picked it up from Uni. Growing up, I didn't swear. Mum didn't like it because, well, swearing and Christianity don't mix that well. Dad didn't like it because I was a child. Moving here to Melbourne, I made a whole new group of friends and swearing was far more common in that group. For some of my friends, swearing causes them to feel powerful, I think. I know swearing always made me feel powerful. Like, 'Yes, I swear, what are you going to do about it? - I really don't care what you think.' And I didn't care. 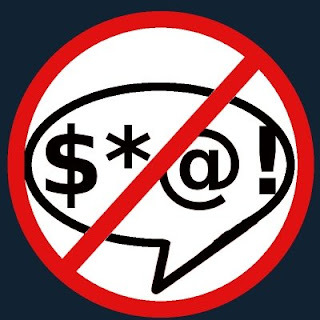 So, what is the point of swearing? Well, beside letting off steam, I believe swearing 'packs a punch'. It adds oomph to a sentence, it forces other people to take notice, it's a little bit angry and loud (even when whispered) and 'in your face'. It's aggressive, and 'don't mess with me because I'm tough'. Or rather, it is what violence sets out to achieve - power. In our society people use violence as a joke all the time. Violence is funny. Until it is done to them. When a violent joke is turned on them, it's not so funny. That's the crux of it. Perpetrators of violence rarely think it's 'that bad'. Victims of violence can still be upset, even traumatised by it. Violence takes many forms; physical is one form most of us recognise, to one degree or another, but emotional violence, psychological violence and verbal violence are all only just finding recognition. So, there you go. I'm officially a wowser and I'm swearing off swearing because I need to have less anger in my life - and I don't think swearing makes me less angry - and I need my home to be a place of love and I don't think swearing shows love, even when teamed with words of love. Also, I want to make better use of the vast English vocabulary that is available to me. I totally agree that swearing is a kin to violence and using is a form of aggression. Even when teamed with the words I love you. Great post Sif and some very interesting food for thought. I know swearing causes a lot of people to feel 'empowered'. There is a lot of talk about how using swear words diminishes their status as taboo, but while I agree it desensitises people to those words, I'm not altogether convinced it enriches anyone's existence to use agressive language, even when it has been watered down by constant use.